Forget the holidays, spring is the busiest time of the year at our house. Spring roughly translates to DO ALL THE THINGS. Yard clean-up from winter, finishing up school, seeking out a 100 bird day during migration, cooking some meals ahead for summer so we don’t have to heat up the house when it’s hot, spring cleaning, fishing season, spring play group — are you tired yet? And let’s not forget that this year I’m trying to get my act together and plan out the kids’ summer activities & be less disorganized in meal planning, too. All in all, that’s just a really long way to go to say that, as usual, I’ve been busy (and after writing that I kind of feel like I need a nap). I didn’t make the time to tell any one story in particular from my week, so I thought I’d give you little snapshots of them all. First, as I mentioned it was Mr Knitting Sarah & my wedding anniversary on Monday. 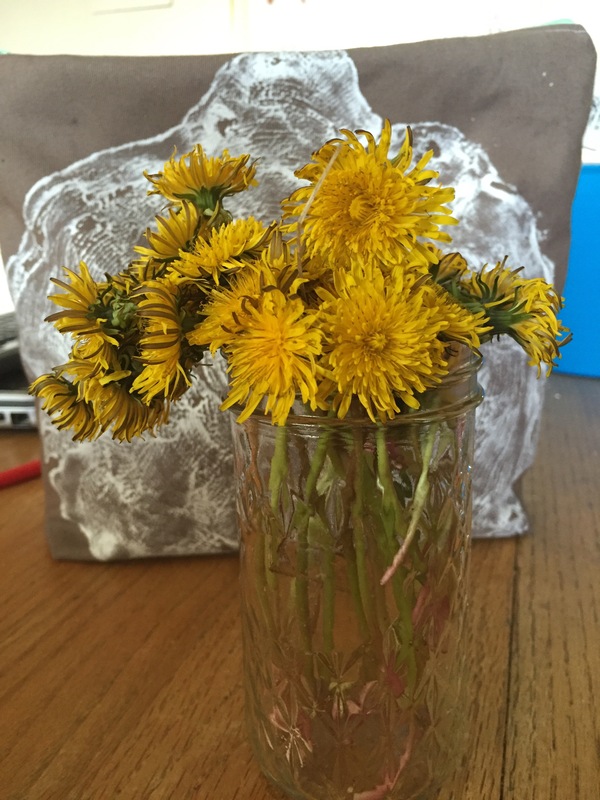 As I finished up my morning’s workout, I heard my daughter loudly ‘whispering’ that my husband needed to get me some flowers. He briefly tried to disagree, but quickly opted to pay my girl to pick this one for me and make me a card. It was the first card I ever got from him that was signed simply, “Your Husband” — for some reason it felt very ominous to me. It was pretty much awesome. 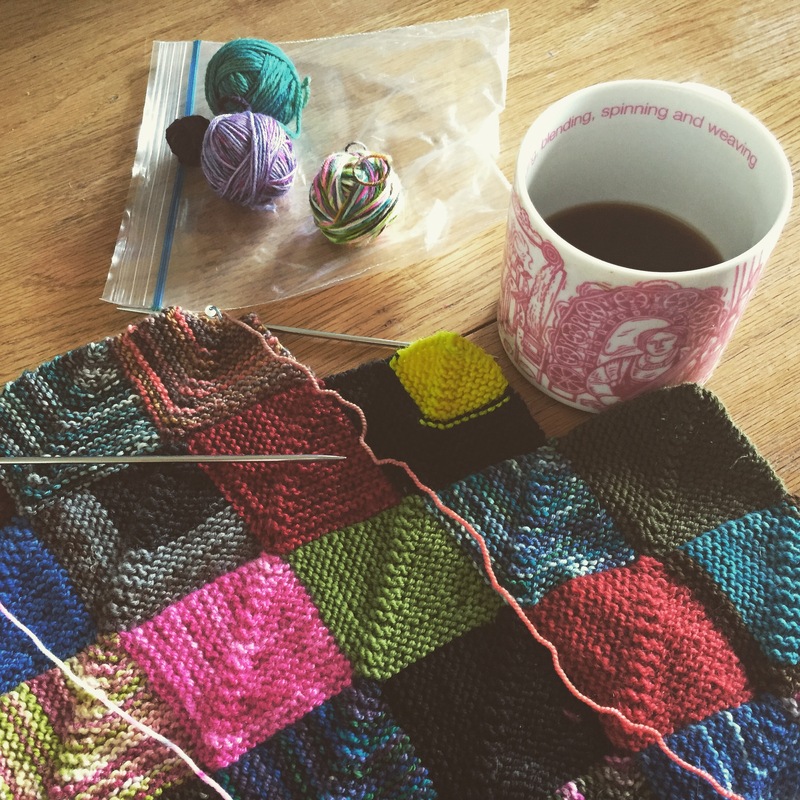 Out of no where, I decided to pick up my Knitted Patchwork project. I’ve added a few new squares to it and I moved it to a little tub instead of smooshed in a project bag. I think maybe perhaps I’ll be more likely to pick it up and set it down more often this way and, you know, actually make some progress. I really do like it when I’m working on it, I just tend to forget about it when it’s not staring at me. I managed to finish up the singles for this spinning project. 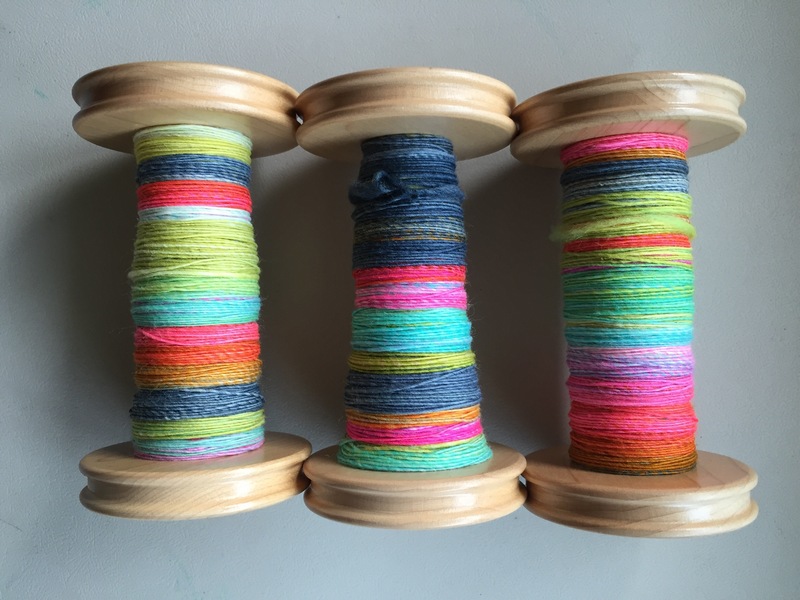 It’s from Spun Right Round and will eventually be a standard 3-ply. Since I’m waiting to ply until the Akerworks Flat Pack Lazy Kate prototype arrives for the test I’m participating in, I started another spin. And today I finished the first 2oz. 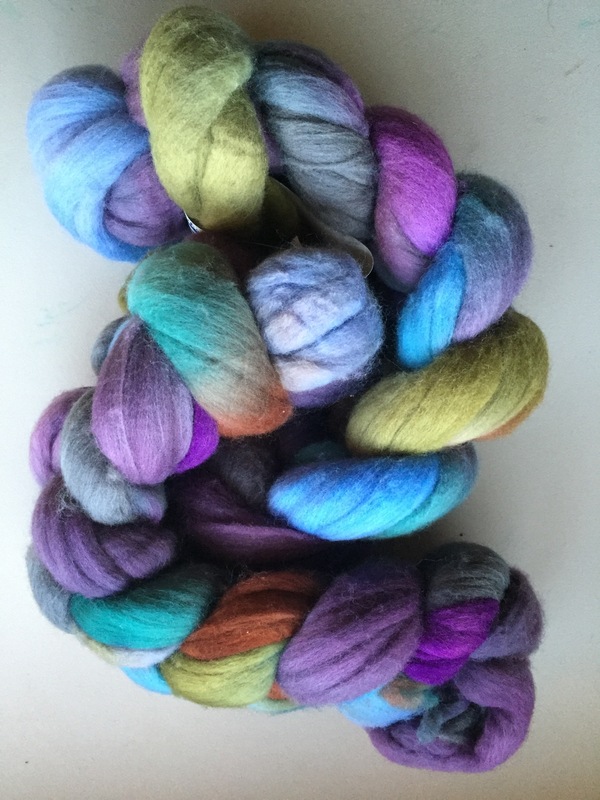 This is from Dyeabolical and is the colorway named Wit Beyond Measure. 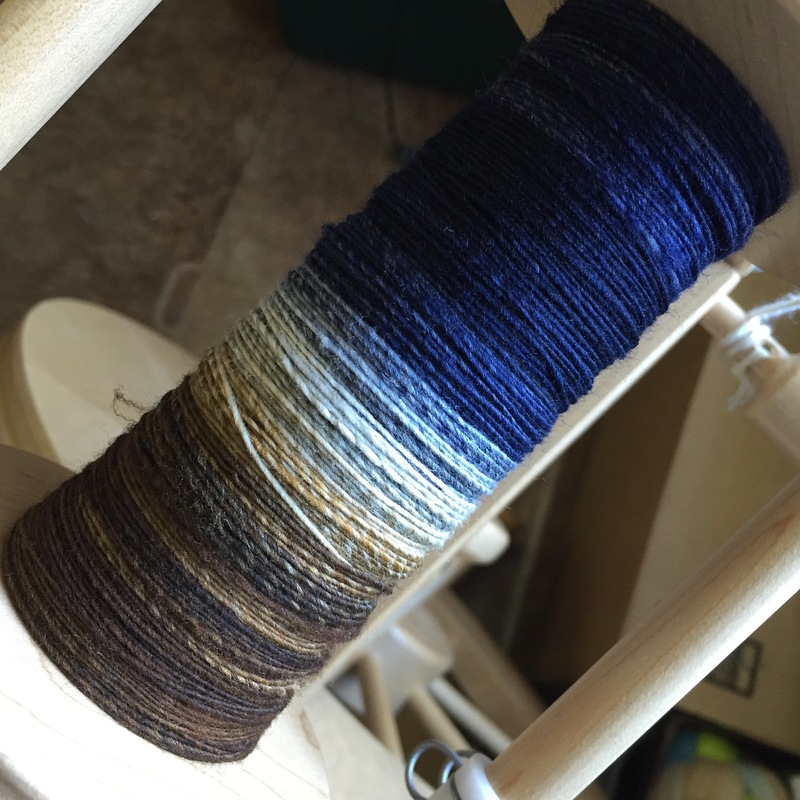 It’s dyed on 100% Targhee and I’ve split it into 4 parts for a a 4-ply. The aforementioned lazy kate has room for 4 bobbins and one question I’m looking to answer is how it handles 4 bobbins from the Lendrum’s plying head. Of course this means I’m now spinning singles on my plying head. I realize I could spin them on a speedier flyer and transfer them to the big bobbins, but I’m kind of too lazy for that. Plus, this is a great exercise for me as I’m making adjustments necessary for a slightly heavier single as well as working on a flyer which I don’t usually use for singles. I’m feeling very good about how it’s been going so far. 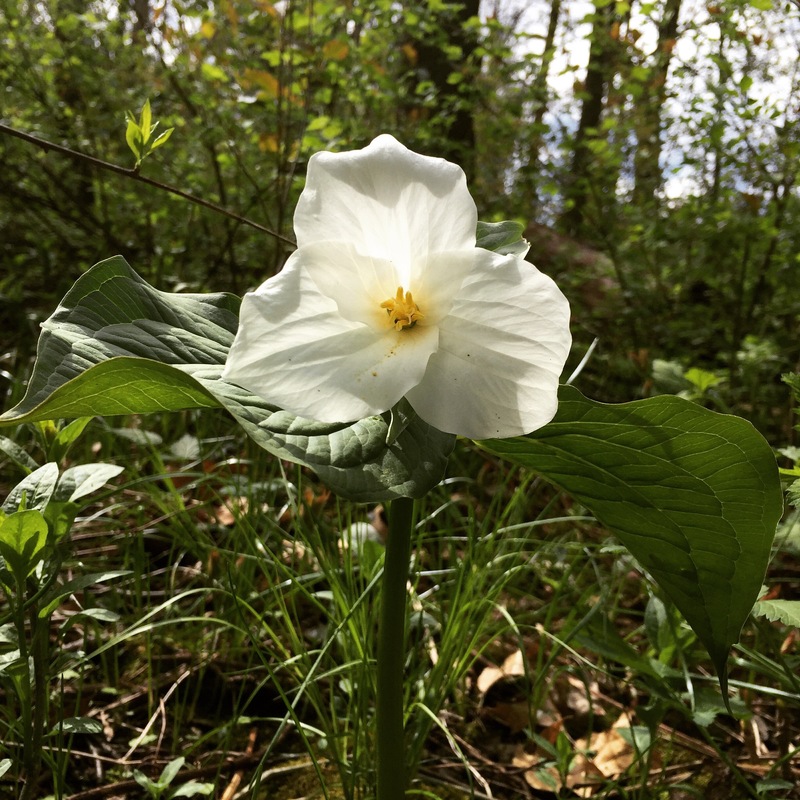 This trillium was the most exciting thing we saw. My kids are very interested in the spring wildflowers and I am awfully terrible at IDing them, so every time we go out I snap a couple photos and go home to try to work out the proper name. This new challenge has been a lot of fun as we wait for the birds to show up. A little while ago I got these very cool skeins in the mail for review. 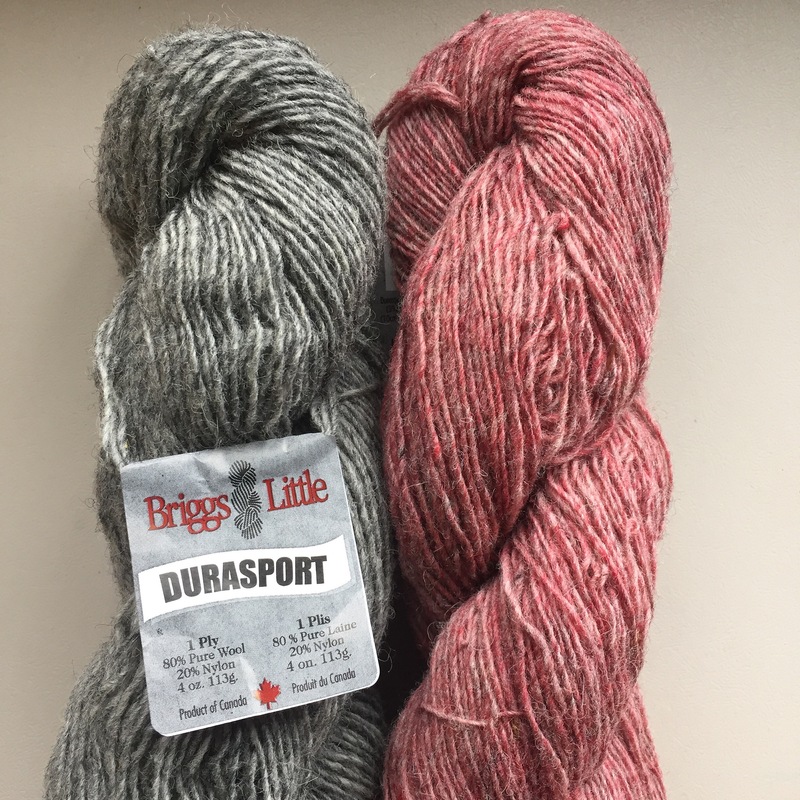 It’s Durasport from Briggs & Little and a very hardy singles wool. I read a number of comments on Ravelry that folks like their socks that they’d made with this yarn, so I picked up Stefanie Goodwin-Ritter’s Chittery Chattery Socks pattern and cast-on. I think they’re just they are knitting up to be just the sweetest! 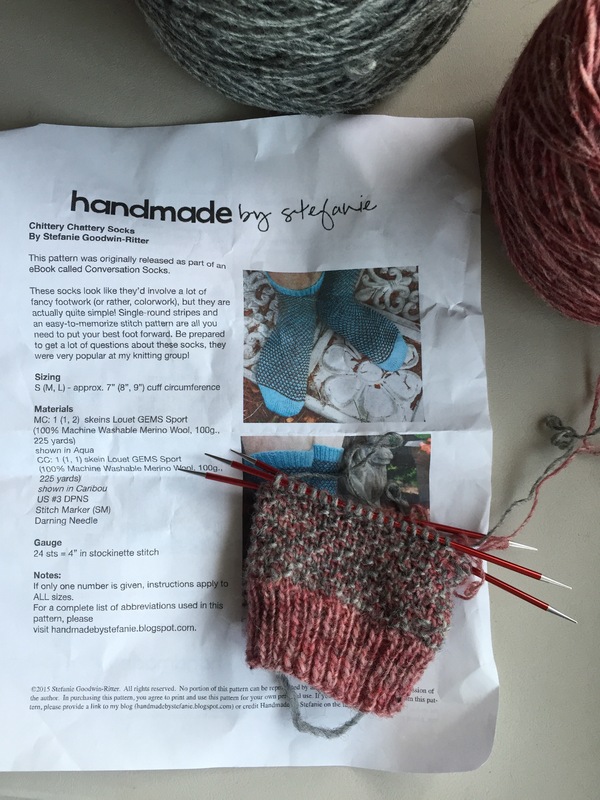 Do pardon the super crumpled pattern — that’s what I call “knitting in real life” and why I love being able to print copies of patterns. I also had a little exciting stash enhancement this week. This is called ‘Luminous Dusk’ and it’s dyed on Superfine Merino by Three Waters Farm. I wanted to share the eye candy, but also the news that Three Waters Farm is holding a Customer Appreciation Sale this weekend. Friday, May 6 through Sunday, May 8 use coupon code TWFMAY201615 to get 15% off your order. If you’ve been wanting to try your hand with this incredible fiber, now’s a great time to treat yourself! Since the nap isn’t going to happen anytime soon, I’m off to get back to work. Have a fabulous Friday, all! wow – that is a serious pile of work you guys take on in Spring. Isn’t spring great??? I love the idea of cooking ahead for hot summer days – now “ain’t you smaht”, as they say around here. 🙂 spinning and knitting are looking wonderful, can’t wait to see how that all plies up. The cooking ahead is all my hubby’s idea — I’m just the one home, so I’m going most of the leg work. I like spring, but I already kind of miss winter. lol! Lol sure you do! Good news then, it will be back before you know it. Exactly — and I’m thinking we’ll have a new furnace by the time the (serious) snow flies, too. (knock on wood) So instead of loving winter, I’ll ADORE it. I think the new furnace is a must. We can’t count on mild winters every year! winter 14-15 we burned 5 tons of pellets – an all time high. Propane use was steady. This past winter, we have burned a bit over 4 tons – still high, but a good chunk of that (about half a ton) was this past month – the stove is just always ON. It feels like it will never get warm out! We get a day here and there (like they are promising for Friday!) before a return to cold. Fingers crossed it’ll be our Christmas gift. Thankfully our house is pretty tight so it retains heat well. We’ve only had it turn on a couple nights the last couple weeks. The furnace makes this little weeping/sighing noise that my dad said sounds like bearings going, so I think it’ll be just in time. ☺️ We’ve had a good mix of 40s – 60s, so that definitely keeps the house warm(ish)! Yay! I can’t wait to see what you picked — definitely share! I have a the Top of the Month Club braid prepped and ready and I have one bobbin left as I wait for the Akerworks Lazy Kate to arrive. I think this worked out perfectly!